José da Silva holds a first degree in “Physics/Applied Mathematics (Astronomy)” at the University of Porto (Portugal), an MSc degree in “Remote Sensing, Image Processing and Applications” at the University of Dundee (U.K.) and a PhD in Oceanography at the University of Southampton (U.K.). He worked as Postdoctoral Fellow at the National Oceanography Centre, Southampton (U.K.) until 2000, when he was appointed as Lecturer at the University of Lisbon (Department of Physics). In 2010 he was appointed Associate Professor at the Faculty of Sciences of the University of Porto. José is interested in many aspects of satellite oceanography, including sea surface signatures of Internal Solitary Waves (ISWs) in synthetic aperture radar (SAR) and other sensors, marine film slicks and oils spills, and other sub-mesoscale phenomenon. His main research activities concern internal wave generation mechanisms by using synergy of remote sensing instruments, numerical models and in situ measurements. 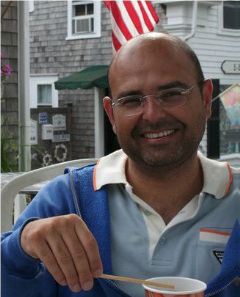 Da Silva coordinated and has been involved in many national and international projects funded by various agencies and is Guest Investigator at the Woods Hole Oceanographic Institution, Massachusetts, USA.